I’ve been too busy skiing to have time to poke fun at it on the internet. What follows are a few very white photos from the past week. 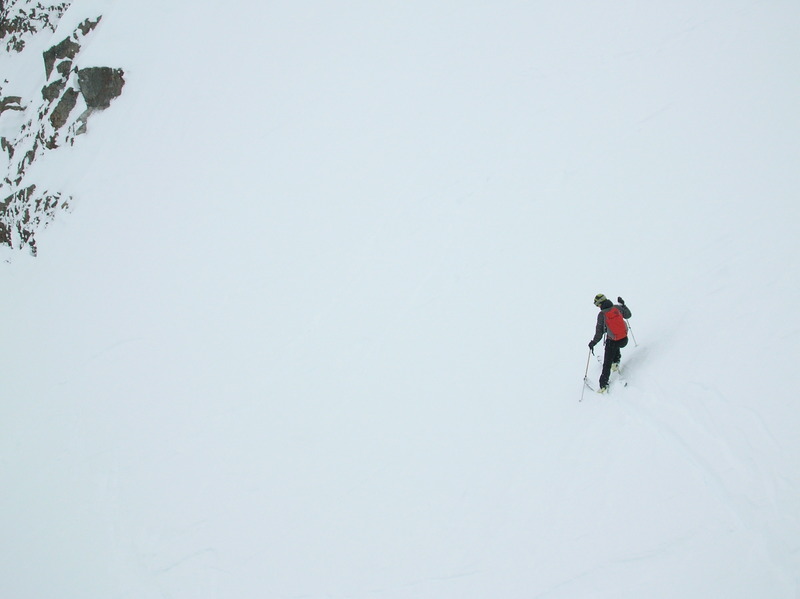 Paul Backhouse and I skied the Australian Couloir on Joffre Peak in a blizzard. I thought that it was a rewarding outing, although I wouldn’t blame Paul if he never wants to ski with me again. 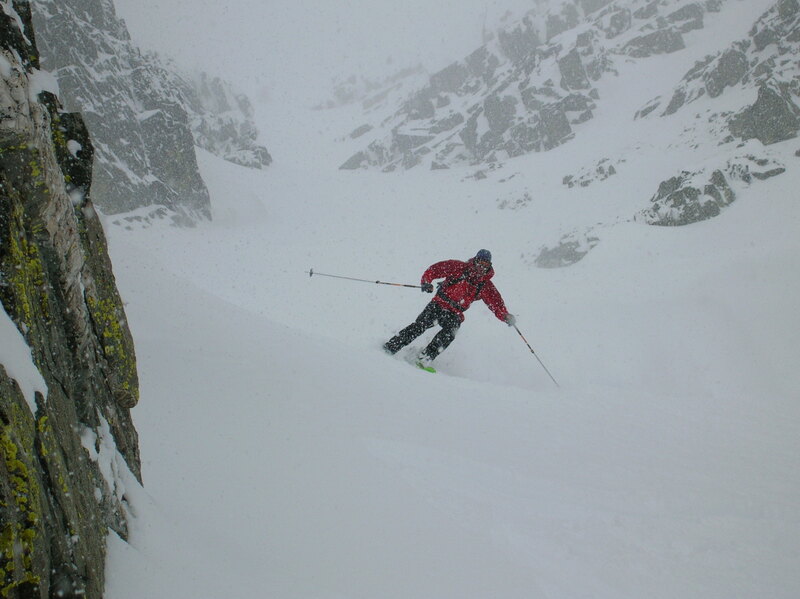 Paul dropping into the Aussie Couloir. It was deceptively icy at the entrance but soon improved. Just as Paul’s feet were developing blisters, a girl in front of us on the trail to Cerise Creek took off at a fast pace. She was on tele gear and was wearing a pack that appeared to weigh at least 70 pounds, so my fragile ego wasn’t about to let me get dropped regardless of the well-being of Paul’s feet. Paul in the Aussie Couloir. It was great to ski this SW facing line with deep powder. Thankfully, Paul is pretty tough for an over-worked lawyer. It was a day when we could have come up with numerous excuses to turn around. 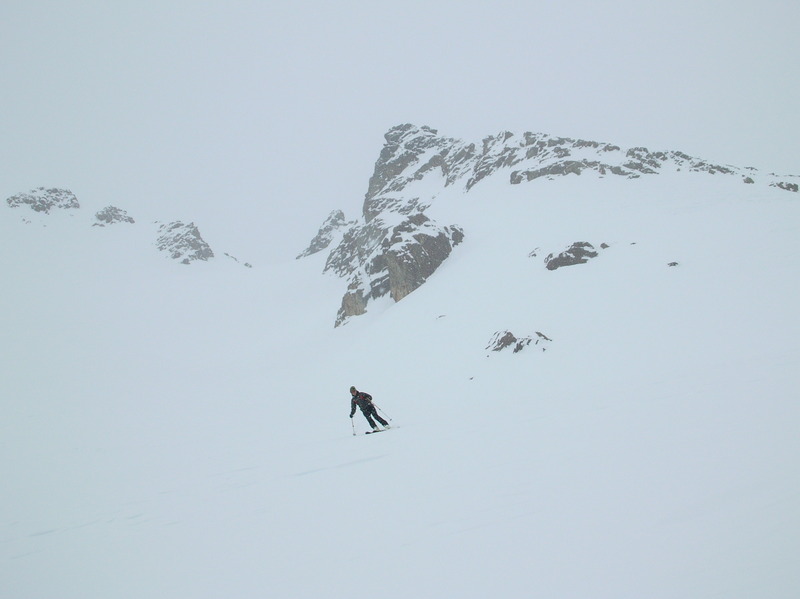 With zero visibility, I accidentally tumbled off a wind-lip on the backside of the Joffre-Matier col. Once we got in the couloir, wallowing upwards in the waist-deep snow was quite horrendous. Cascades of spindrift from the adjacent rock walls completely filled in my tracks which meant that we were both effectively breaking trail. Possibly powered by reserves of motivation resulting from knowledge that the rest of his week would be spent behind a desk, Paul was keen to push onwards. 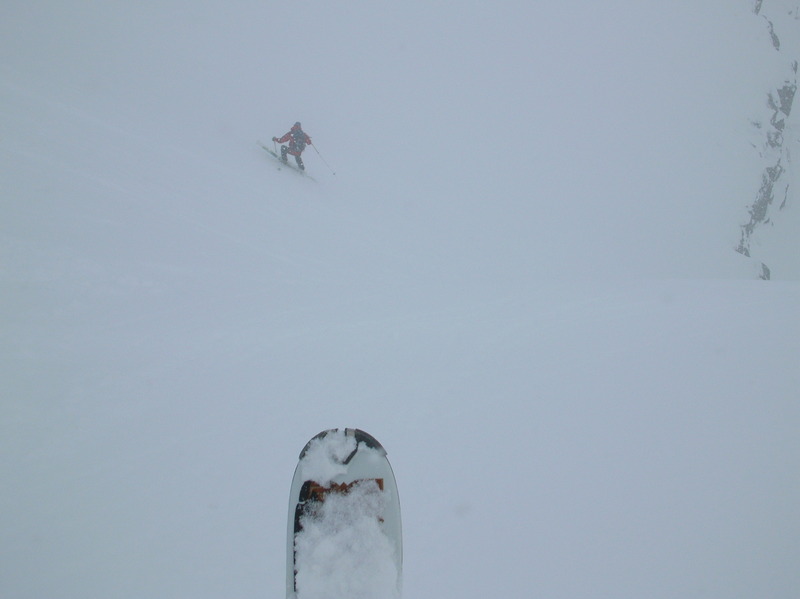 We were rewarded with some great skiing even if we couldn’t really see what we were doing. Davey Mitchell getting ready to ski off the north side of Peak 2318 in the Steep Creek Basin. Great snow, weather and company were the themes of this day, as well as the previous day skiing the Musical Bumps with Karina. Karina climbing the third pitch of Cling Peaches at the Malemute. With an upcoming road-trip to the desert, it was nice to work out some of the early season jitters on a few steep crack climbs. After a few days of relatively mellow skiing and climbing, I suggested to Karina that we ski Fissile Mountain in the Spearhead Range behind Whistler. It may have been false advertising on my part or a momentary lapse of Karina’s normally very good judgement, but she agreed that it sounded like fun. Karina skiing the NW Face of Fissile Mtn. I don't think they have skiing like this in Ontario. As we skied out of the ski area and negotiated some awful breakable crust through the Musical Bumps, we sweated under the increasingly powerful spring sunshine. However, by the time we finished the bootpack and joined another group of slackcountry skiers at the top of the Northwest Face, the weather was deteriorating rapidly. The Northwest Face is supposedly 55 degrees in steepness at the top, and although these sorts of angles tend to be grossly exaggerated, it’s fair to say that it’s pretty steep. 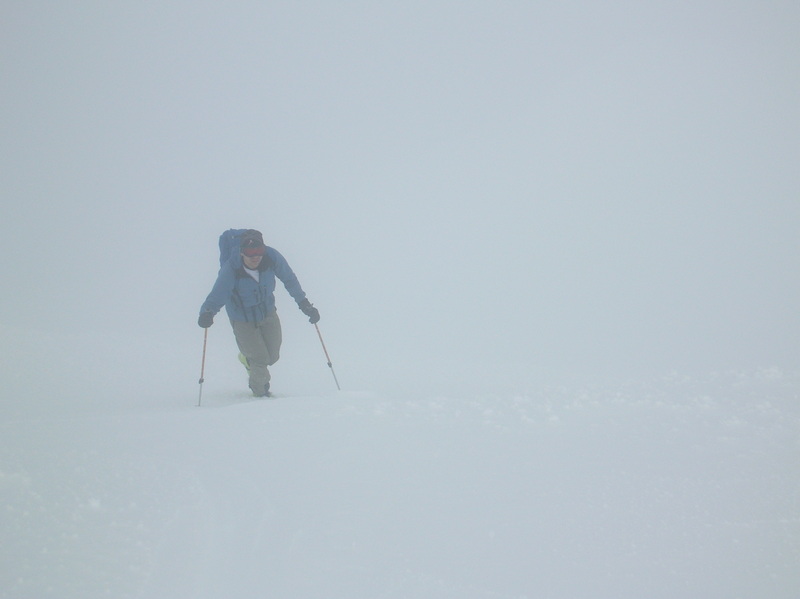 Conditions were also far from ideal with flat light and variable, crusty snow. Nonetheless, Karina did a great job skiing it; not a bad ski descent for a recent Ontario transplant who’s only been skiing for a few years. Ironically, the most memorable moment of the day occurred while skiing out the normally monotonous Singing Pass Trail. I rounded a corner to find a small black bear sitting smack in the middle of trail, apparently oblivious to my presence. When Karina arrived, her first impulse was to go up to the bear and give him a hug. I’ve had enough bear encounters while working in the bush to make me a little more wary, but this bear seemed completely unconcerned with us and there was no sign of a nearby angry mother. In fact, the bear, who had presumably just awoken from hibernation, was so dopey that we could barely get him to move off the trail. Eventually our pole-banging and yelling incited him to wander over to a tree-well a few feet from the trail and climb in head first with his bum sticking out in the air. This was enough for us to slip past and continue down towards a well-earned meal of takeout fish and chips. Karina skiing out the bottom of the NW Face on Fissile. After an enjoyable day of cragging at Penny Lane (I don’t think you can call yourself a Squamish local unless you climb at Penny Lane at least a few dozen times a year) I was mysteriously motivated to do some more skiing. Stefan Albrecher was also keen, although his primary concern seemed to be to get in a good workout. 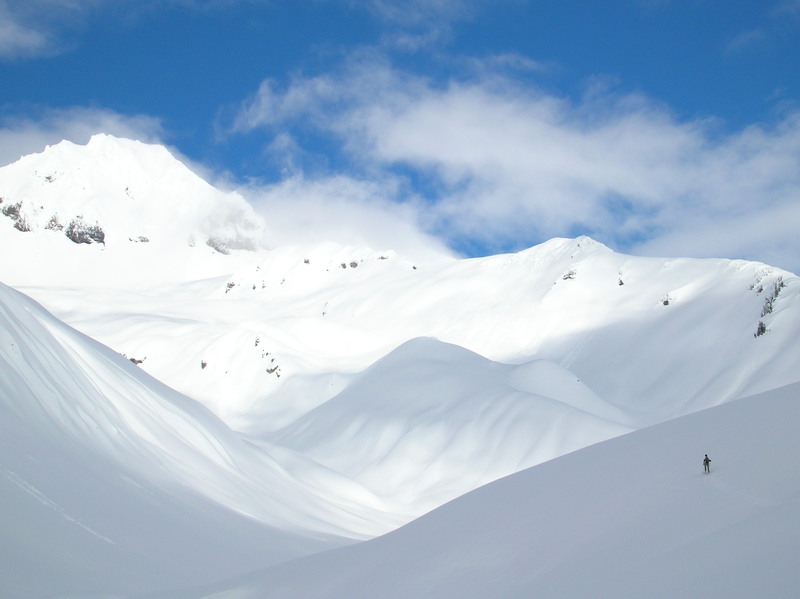 The weather forecast wasn’t particularly inspiring so Stefan suggested that we ski to Elfin Lakes and back three times. To me, this sounded like the most horrible form of torture imaginable, so as a compromise I suggested that we try to ski Mt. Garibaldi from the Elfin Lakes side. I think that Stefan only agreed to this idea because he figured the weather would be so poor that we’d end up reverting to his original plan. Stefan begins the long slog out of Ring Creek. 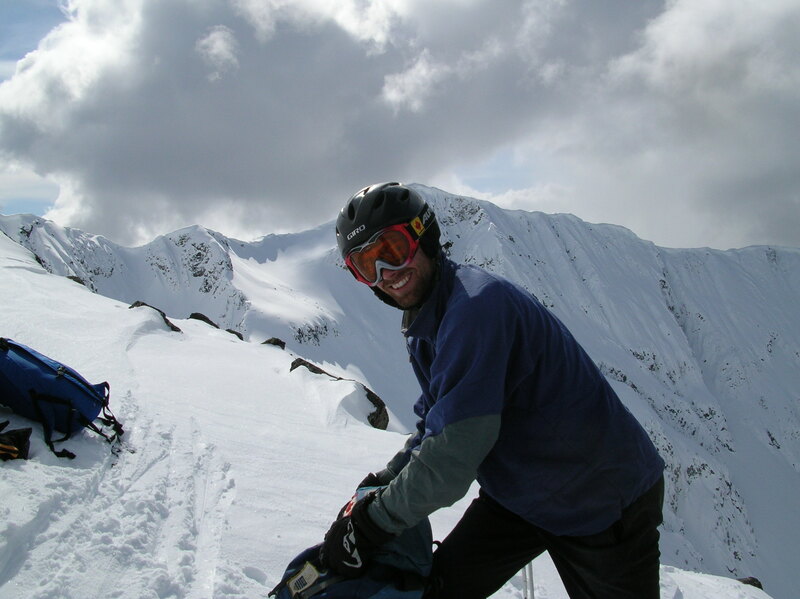 A few years ago, I returned from a climbing trip to Europe to find Stefan filled with angst and wanting to suffer through some long ski traverses. Unfortunately (or perhaps fortunately for me), the weather didn’t cooperate and we had to settle for skiing the Garibaldi Neve. It was the only day of skiing I did that year and I had to borrow some rather heavy skis, but we still managed to ski the traverse in a little under seven hours. On this day, the conditions were a little slower and we were perhaps a little less angst-filled. Nonetheless, Stefan set off at a pretty good pace and I began to get a bit concerned when he mentioned that he’d been doing 100 kilometers of trail running a week. At the Elfin Lakes hut, the weather was gorgeous and we could scarcely justify not continuing. The same could not be said at the highpoint of the Neve a few hours later: the wind had picked up and Garibaldi had become enshrouded in clouds. This appears to be the recurring theme of my recent ski adventures. Mt. Garibaldi is an unassuming and bulky snow-covered massif named for an Italian war hero (isn’t that supposed to be an oxymoron?). 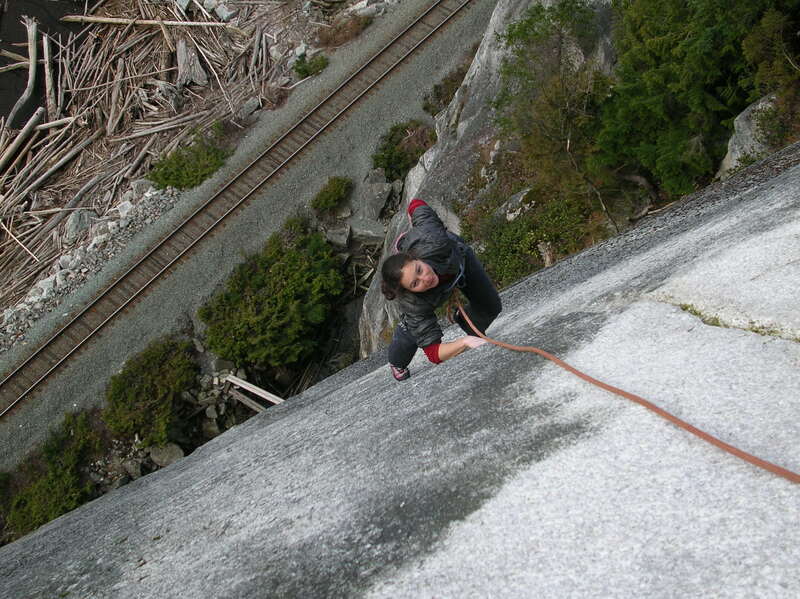 However, it’s also a local Squamish landmark that I’d never actually quite been to the top of, and as result I felt a slightly silly compulsion to continue in spite of the weather. Stefan didn’t complain, so we wandered upwards eventually encountering some other tracks a little ways below the summit. Stefan arriving at the summit of Mt. Garibaldi. I skied off the summit mostly just to be able to say that I did. The variable, wind-scoured crust and complete lack of visibility resulted in some not particularly stylish double pole-plant jump turns and even some shameless side-slipping. Eventually we skied out of the clouds and weighed our options for getting home. The car was at the Diamond Head trailhead, but we could see tracks heading towards Brohm Ridge and the knowledge that that route would be almost all downhill to the highway proved to be too tempting. 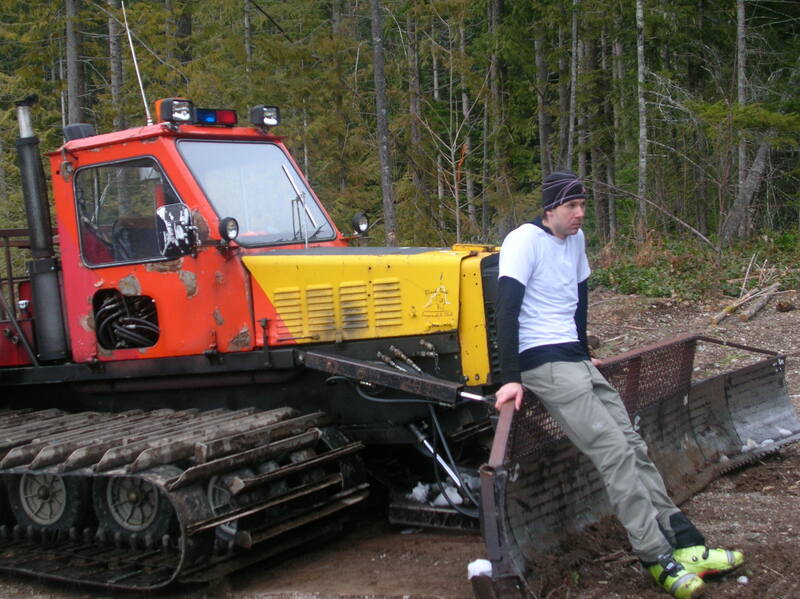 As we skied out down the snowmobile-rutted logging road, we caught up to the two guys whose tracks we’d been following. Not only did they offer us a ride back to Squamish, they even had beer waiting at their car. We were toasting our respective successes less than ten hours after we’d set out that morning. Stefan’s philosophy has always been to do the traverse, and then worry about the logistics of getting back to your car when you’re done. It looked liked this strategy had worked out beautifully for us yet again until I realized that I’d left my car keys at the trailhead. It was only thanks to my extremely kind-hearted roommate Davey that we were able to retrieve Stefan’s car. This thing was broken down and as a result the bumps on the Brohm Ridge road had become so bad that all the snowmobilers were going elsewhere. I think that Stefan is disappointed that our day is over so soon and with so little suffering. As I write this, snow continues to fall in the local mountains. I feel a tinge of regret to think of the skiing I’ll be missing when I leave in a few days for sunny rock climbing in desert of the American Southwest. It may be for the best however; my insistence that I’m not a skier is beginning to sound a bit hollow.